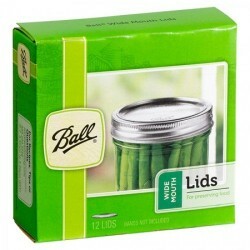 Fermenting Jar With Tin BPA Free Lid Ball Mason Half Gallon. I have an earlier model with the plastic lid. The air valve works a treat and I made the best sauerkraut. All so easy and all in the jar you store it in. I love these and recommend them highly. So much easier than making a mountain of kraut and then nowhere to store it all. 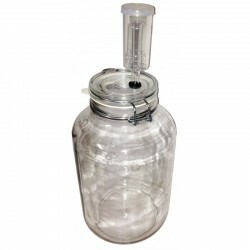 Preserve your food the natural way with this 2 Litre USA made Fermenting Jar. Fermenting food is the oldest form of preserving with the technique being in use for over 4000 years! Yes you can make Pickles, Kimchi and Sauerkraut, and that is just the start. Ferment all your veggies and fruits into delicious foods which are much better for your health! Ball Mason Jars are of the highest quality and contain NO BPA! (Bisphenol A). 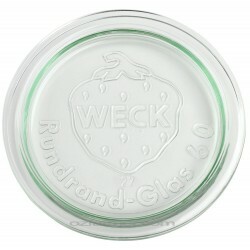 All Ball wide mouth jars have wide openings for tidy, easy filling. Insert the airlock into the rubber hole on the lid, being careful not to push too hard. Once the product is fermented, you can store it in the fridge with the air lock in situ, or remove the lid and replace with a storage lid such as the one piece gold lid.